Hair fall is an everyday struggle. Aren’t we all jealous of people with beautiful hair? Well, I’ll let you in on a secret – maintaining awesome hair is easier than you think! It just needs regular care and attention. As the saying goes: knowing is half the battle. Let’s first understand what are the various types of hair fall! Before we dive in, we should set the record straight – hair fall is a natural part of the hair growth cycle, so it is important to understand that zero hair fall is not possible. In fact, I was shocked to learn that it is normal to have natural hair fall of about 50-100 hairs every day! It may sound alarming, but fret not – for a healthy scalp, each of those hairs that are shed are being replaced by an equal number of new hairs. 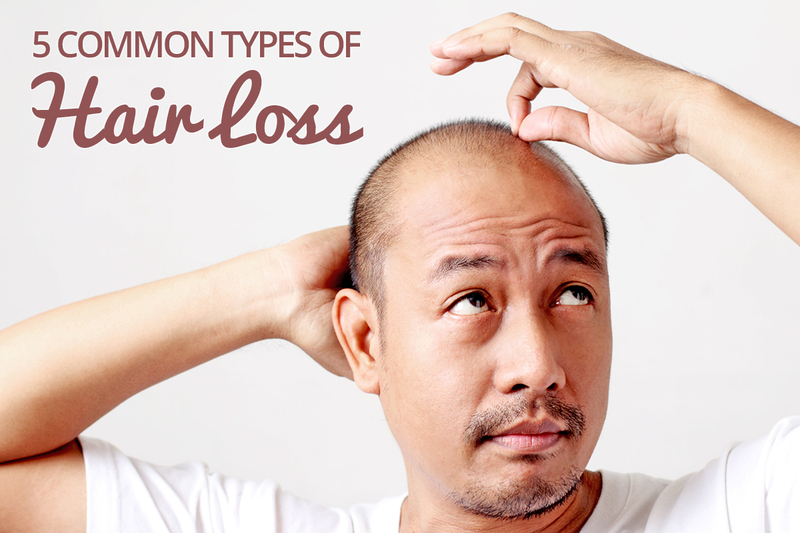 It is only when you have excessive hair loss that you should start paying attention, especially if it comes out in clumps rather than individual strands here and there. When in doubt, it’s best to consult a hair care specialist or trichologist. This type of hair loss is associated with genetic responses to the hormone Dihydrotestosterone (DHT) in the body, and differs between male and females.Male pattern balding typically involves a receding hairline and thinning of hair around the crown. Hair on the sides and back of the head tend to be less affected. Female pattern balding usually starts with thinning of hair across the central area of the top of the head, which may spread to the sides over time. This occurs when the natural hair growth cycle is disrupted. Simply put, the number of hair follicles actively growing hair is greatly reduced, resulting in large number of hair falling at the same time and a lower number of hair growing to replace them. This leads to thinning of the hair, and can be caused by both emotional and physiological stress. Also known as Alopecia Areata, Spot Baldness is characterized by hair loss from some areas of the body, leaving bald patches on the scalp. It is believed to be an immune system problem where the immune system mistakenly attacks hair follicle cells. Fungal infections can cause skin conditions such as ringworm or folliculitis that will lead to patches of temporary baldness. If left untreated, the baldness can become permanent. This refers to damage to the hair that is severe enough to cause significant amounts of hair to break off. This is usually caused by harsh chemical or heat treatments to the hair.